Healthcare industry types have long eyed Amazon’s forays into the space — from possibilities with Alexa, to wholesale pharmacy applications, to its recent venture with J.P. Morgan and Berkshire Hathaway to lower employee health costs. Now, The Wall Street Journal reports the retail giant is expanding into an area that hits especially close to health system bottom lines: medical supplies. Amazon is already talking with an unnamed major health system in the Midwest, and invited multiple hospital executives to its Seattle headquarters, the newspaper reported. While its ambitions aren't well known, the company’s famous (or infamous) disruption could find an entry point in hospital supply chains for a few reasons. To put it bluntly, hospitals spend a lot of money on the medical supplies they use – as well as the ones they end up throwing out. On average, hospitals spent $3.8 million per hospital on medical supplies in 2013, which was 15% of total expenses. Some hospitals attributed as much as 40% of their expenses to supplies, according to research published in Medical Care Research and Review last year. Supply expenses are second only to labor for hospital spending. One study found hospitals on average spent $4,470 per admission on supply expenses. Some hospitals spend a lot more than others. Surgical hospitals spend the most, while behavioral and psychiatric hospitals spend less. And the costs have been rising, according to research in Health Affairs from July 2016. Intermediate costs for goods and services at hospitals grew by more than 100% from 1997 to 2012, and the main driver of that growth was purchased materials. Medical supply costs specifically grew more rapidly that other supply costs from 2007 to 2012. Hospitals have tried a variety of ways to cut these costs. Studies have shown physicians are often unaware of the costs of the supplies they are using — or cheaper alternatives — so some hospitals have tried to educate doctors on that front. Also, value-based payment methods like bundled models take into account an entire episode of care, which includes itemized supply expenses. That could bring more scrutiny to costs. Authors of the Medical Care Research and Review study said numbers can vary based on what is considered a medical supply, and whether associated labor costs are included when calculating them. “Without a doubt, there is a need for more fine-tuned data on supply expenses to understand the efficacy of cost-saving strategies,” they said. Amazon Business’ healthcare landing page touts Alexa and Dash technology for ordering capabilities as well as data integration into purchasing systems for inventory and purchase ordering needs. The page also notes a goal of "bringing comparison shopping to healthcare," with "exclusive prices." Since Amazon already ships groceries and other perishables using cold chain technology, it may be an easy shift to use the same capabilities to keep pharma supplies temperature controlled. A recent report from Markets and Markets projected the global healthcare supply chain management market will reach $2.3 billion by 2022, from an estimated $1.4 billion in 2016. Big name players include McKesson, Cardinal Health, AmerisourceBergen, Owens & Minor and GHX. Ann Hynes, healthcare analyst with Mizuho, said Amazon would likely need to make an acquisition to become a real competitive threat, and private medical distributor Medline is the most likely target. Hospitals will want a solid chain of custody. “Hospitals need to know where the product comes from, that it is FDA approved, and that it is sustainable for use, especially for items that are used to operate on patients,” she said. The company with the greatest overlap with Amazon is Cardinal Health, but only 4% to 5% of its operating profit is exposed to the Amazon threat, Hynes said. 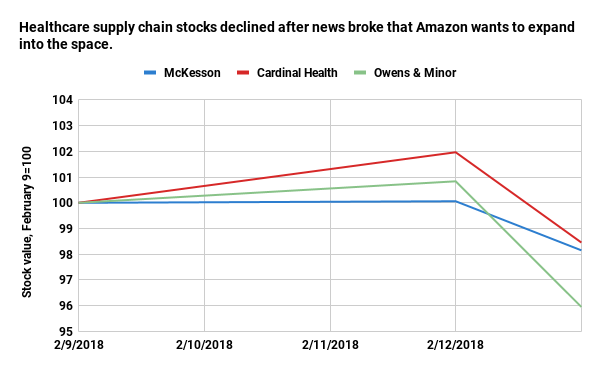 When the markets opened after the Amazon news broke Tuesday, the major incumbent healthcare supply chain players’ stocks took a nosedive. Also reported on Tuesday, Walgreens is considering buying portions of AmerisourceBergen it doesn't already own. Both storylines point to disruption in the healthcare ecosystem. Both new entrants —especially retail players — and legacy companies are currently assessing the $3 trillion healthcare market as traditional access points and consumer expectations shift within the industry. “The retail players ... are looking to leverage their core capabilities to capture a part of that very large market,” Brian Williams, director of advisory and strategy and PwC Consulting, told Healthcare Dive. Given Amazon’s supply chain experience and strong consumer foothold, current heavyweights have some reason to fear. One way Amazon may be looking to lower healthcare costs is by inserting itself throughout the medical supply chain and episodes of care, so that it can influence expenses in multiple parts of the process. An Amazon representative told The Journal the company wants to build out a “marketplace concept” as a seller to hospitals and outpatient facilities. “With medical supplies specifically, we hear from both manufacturers and healthcare customers that they want to find ways to simplify purchasing and reduce costs as a means to address systemic issues that take away focus from patient care,” an Amazon Business spokesperson told Healthcare Dive. “For example, many large health systems have numerous satellite facilities and physician offices, and as care shifts closer to the home, they are looking for ways to simplify purchasing supplies for locations beyond the hospital,” the person continued. Highlight medical supply price differences. Keep in mind these ideas are speculative and would require interoperability kinks to be ironed out among clinical data creators, still an issue in the EHR industry. Cerner was rumored last fall to be in deal discussions with Amazon over its population health product HealtheIntent. No deal has been announced at this time. Amazon guards its Prime subscription numbers, but more new paid members in the U.S. joined the service last year than any previous year. Regardless of whether Amazon explores a Prime business for providers (Amazon does currently offer Business Prime Shipping for multi-user business customers), the sweet spot for the company could be marrying its consumer engagement expertise with b2b principles in healthcare, he said. “What this represents is an interesting opportunity in the b2b2c dynamic,” Williams said. Healthcare providers, especially U.S. hospitals, have been feeling the strain of increasing expenses in the face of softening admissions and payers pushing patients to lower acuity settings. In addition to labor and revenue cycle management, supply chain management is a major area where hospital budget departments can trim high variations in spend-per-item. Amazon could help providers’ bottom line if the company is able to notably decrease supply chain costs and/or provide a meaningful value-add for purchasers that ease administrative burden. And the time could be ripe. It’s difficult to look at the latest news in isolation from the J.P. Morgan-Berkshire partnership announced last month. At the same time, few details were given, and it’s unclear whether and how Amazon’s medical supply business could fit in. It does, however, show the intense interest in bringing down healthcare costs, a thorn in the side of employers throughout the country. Patients don’t really know where their hip implant is coming from or what company made the gauze their doctor is using, but the bills that patients and their payer end up seeing will certainly reflect that information. The next era of healthcare business “will be defined by delivering value and transparency,” Chase said.